These are delicious, and so easy! They’re sure to be a crowd pleaser, whether you’re entertaining a lot of people, or just your family. Either way, they’re comfort food without the typical calories. Just keep in mind that even though they take hardly any time to prepare, they take a long time to bake. Serve them with a hearty but healthy meat, such as a pork tenderloin roast, or roasted chicken breast. Don’t forget your veggies! Acorn squash are considered carbohydrates, not vegetables (just like corn, peas, and potatoes). What’s great is that acorn squash are a healthy unrefined starch and have a ton of nutritional value because they are phytonutrient rich! They are full of beto-cartene, which protects against cancer, heart disease, aging, and helps with eye sight. But just because they’ve got all that awesome superfood value, they’re not a free food. Aw, darn it…that’s Jenny Craig lingo. Let me explain. At Jenny, we considered non-starchy vegetables to be an unlimited option. Or, a free food. Eat as many veggies as you like, and never worry. But starches…that’s different. Starches should contribute about 60% of your daily intake. So I guess what I’m saying is, enjoy…but don’t splurge. And add a veggie to your meal. Preheat the oven to 375 degrees. Cut the squash in half lengthwise. With a big spoon, scoop out the seeds. Make sure the squash lie flat, skin side, by trimming the bottoms if necessary. Arrange cut side up on a rimmed baking sheet. Sprinkle with pepper to taste. Pour 1 Tbsp of half & half in each squash bowl. 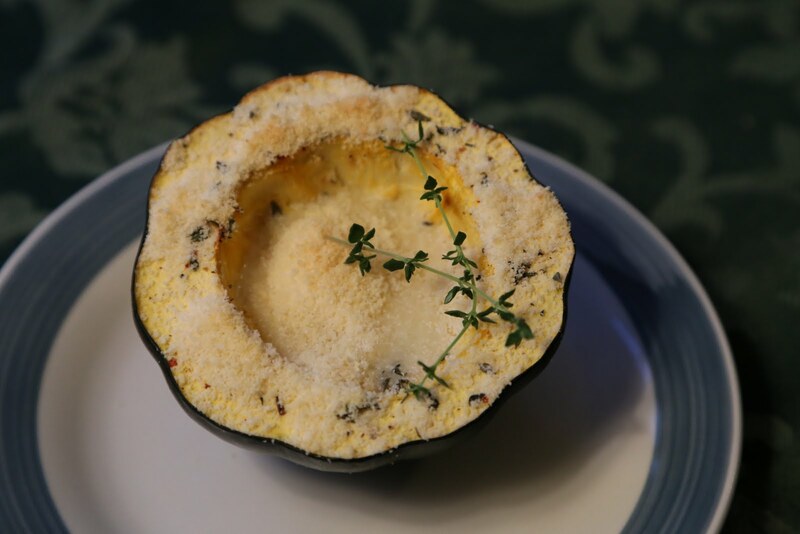 Pull the leaves off of two thyme sprigs and sprinkle on one squash bowl, making sure to get some leaves in the cream. Repeat with the other bowls. 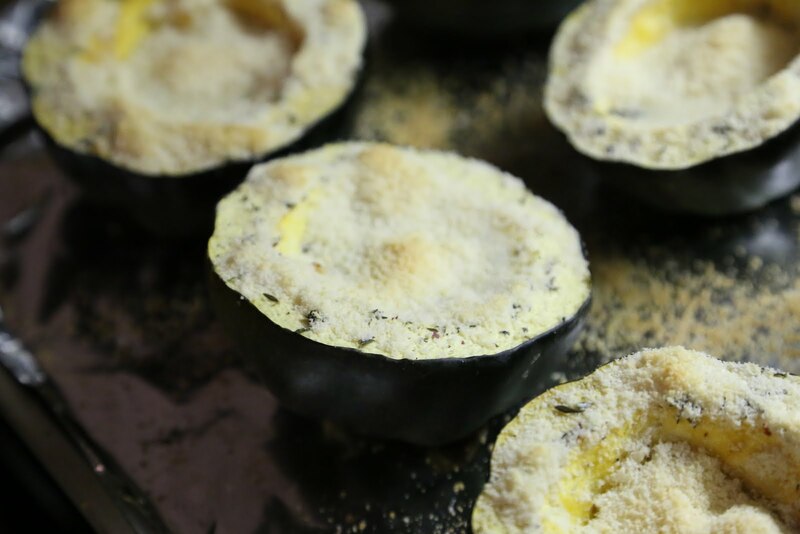 Bake for 35 to 40 minutes, or until a fork stabs into the squash with no resistance. Add the Parmesan cheese by sprinkling 2 Tbsps into each bowl, making sure to get a good amount in the cream. Bake 15 to 20 minutes, or until cheese is melted.